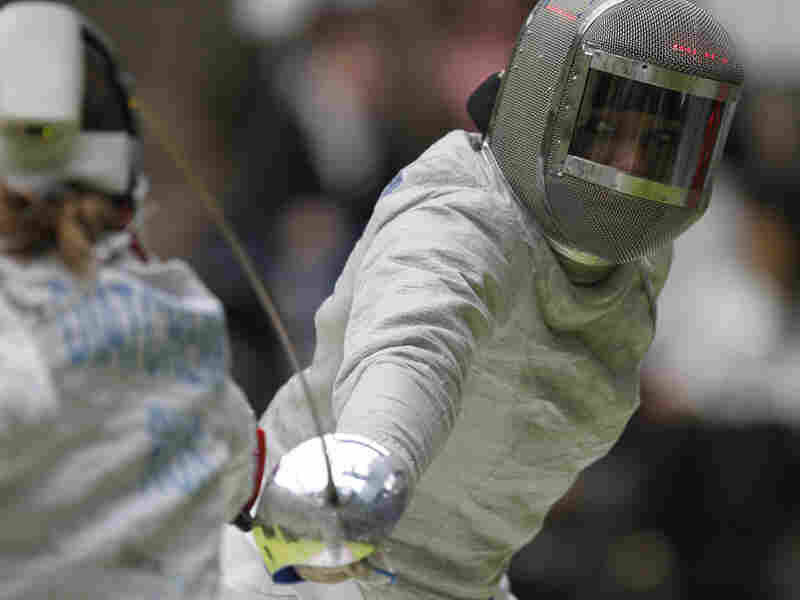 An American Muslim Fencer Lunges Into U.S. Olympic History In Rio : The Torch Fencer Ibtihaj Muhammad is set to become the first U.S. athlete to compete in the Olympic Games while wearing a hijab. Fencer Ibtihaj Muhammad is set to become the first U.S. athlete to compete in the Olympics while wearing a hijab. 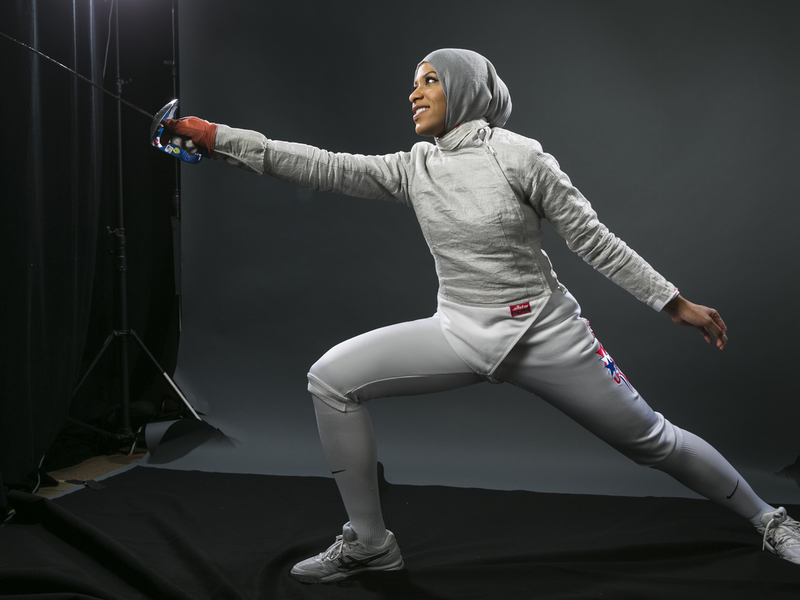 Ibtihaj Muhammad started fencing after running track and playing volleyball, softball and other sports. She began covering in high school as part of her faith. To play volleyball, she wore sweatpants and a T-shirt along with her team's uniform, never feeling fully part of the team. Fencing solved that problem and, she says, gave her focus. "I enjoy being able to critique myself when I'm finished fencing," she said in a 2012 interview with NPR's Michel Martin. "It's really easy to lose and be able to fix your mistakes, whereas on a team, you know, I guess whether you win or lose can be in the hands of someone else, and I've never felt comfortable with that." At this year's Women's Sabre World Cup in January, Muhammad took home bronze. It was enough for her to finally make the U.S. Olympic team. In the months before arriving in Rio, she continued her training at the Fencers Club in New York City with her coach, Akhnaten "Akhi" Spencer-El, who started working with her in 2009. Spencer-El says her personality is a perfect fit for sabre fencing — strong-willed, aggressive and determined to win since day one. "Sometimes her personality would get her in trouble only because young kids, they question things — you know, 'Why do I have to do push-ups' and stuff," he says. "But when you do that, you know, there are consequences." Over the years, Muhammad learned to channel that spirit. She's now ranked No. 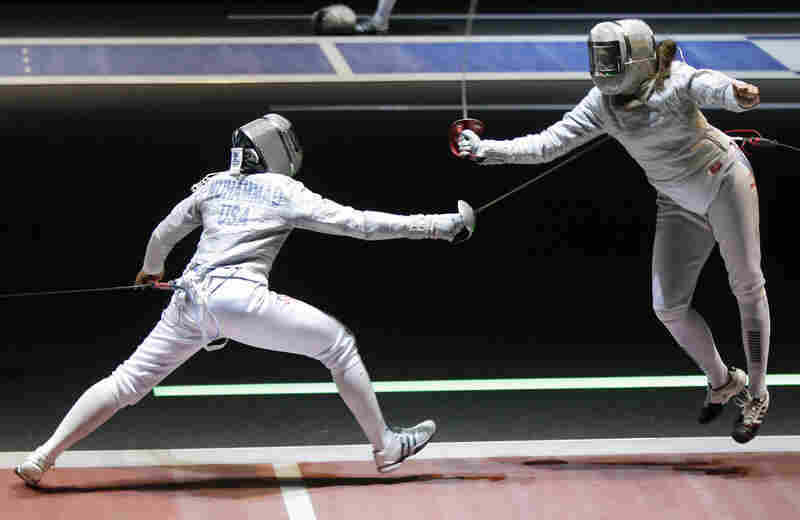 2 in the U.S. and eighth internationally in women's sabre fencing. She also launched a fashion line of modest women's clothing after graduating from Duke University. Through it all, Spencer-El says she has stayed poised against her competitors and a harsh public spotlight while wearing a hijab. "Going through security and everybody comes out but her, or taking her into another place in the airport to search her than everyone else — it really doesn't even faze her. It's like, 'Here we go again,' I guess," he says. She shared some of her frustration with her Twitter followers in March after an incident with a volunteer at the South by Southwest festival. The festival organizers later apologized to Muhammad, who was invited to speak on a panel called "The New Church: Sport as Currency of American Life." "Sometimes she tells me, 'Peter, being a black woman is not easy. Being a Muslim woman is not easy. Combine the two, I walk down the street, I catch hell,' " says Peter Westbrook, one of Muhammad's fencing mentors. Westbrook first met Muhammad through the foundation he started to introduce fencing to youth from underserved communities in the New York City area. Most of the students in his Saturday fencing classes are black or Latino and from single-parent homes. Back in 1984, Westbrook became the first African-American fencer to win an Olympic medal. The bronze medalist says he uses that experience to help Muhammad navigate through a predominantly white sport. "She's used to fighting. She's used to things coming at her," he says. "This sport is natural for her, because this is a nerve sport." In April, she tweeted about a man who she says followed her down a street in Manhattan, telling her that she looked "suspicious" and asking if she was "going to blow something up." "America is all that I know. I feel American down to my bones. For anyone to challenge that idea, that I'm not American or that I don't belong, it's frustrating," Muhammad says. "I want people to see a Muslim woman in hijab and represent the United States this summer. I don't want people to think that that's out of the norm."